Campbell Hausfeld VT6271 Air compressor will handle almost all tasks you would need to be done using air tools. We can attribute this feature to the appliance’s airflow of 10.2 CFM @ 90PSI and the 30-gallon tank it retails with. However, that outstanding performance comes at a price. Because the unit is quite too heavy at 182 pounds. Lifting it off the ground will be a hassle. The belt pump is also designed for heavy-duty use. And the unit itself has been rated for 5000 hours of life. 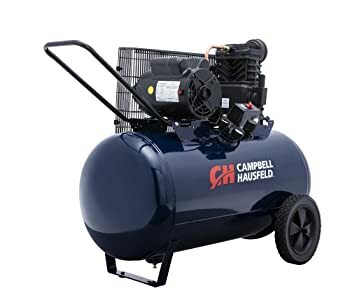 All Campbell Hausfeld 30 gallon air compressors are made in the United States. which is the first sign of excellence and quality. Furthermore, the products retail with a 3-year warranty. This means that the first 3 years after you acquire the product, you can rest assured the company will fix any faults you notice on the unit. Customer rating of the Campbel Hausfeld VT6271 on retail sites are also quite impressive. It’s clear that individuals who acquired this product in the past are the happiest and they do not regret a thing. The only complaint I heard was mostly about parts that were damaged during shipping. But I presume those were replaced as well.